Troops of 119 Task Force Battalion have successfully repelled an attack by the Boko Haram terrorists on Tuesday in Kangarwa, Northern Borno State. 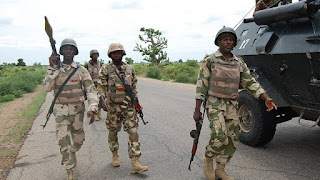 In a press release by the Acting Director Army Public Relations, Colonel Sani Kukasheka Usman explained that the attack started at about 6.30pm. He stated that the attack was successfully repelled after about 3 hours of exchange of heavy gunfire that inflicted tremendous casualty on the terrorists. He noted that the successful repelling of the attack was made possible by support from the Nigerian and Chadian Air Force fighter jets. Unfortunately, two of the Army’s gallant soldiers died while seven were wounded during the attack. Due to poor visibility, the number of terrorists killed could not be ascertained for now. While, the bodies of the gallant soldiers and those wounded in action are being evacuated while the unit is carrying out mop up operations.